On Saturday the VOR Green Team celebrated the completion of their new Volvo Open 70 with a ‘Thank you, China’ event at McConaghy Boats in Zhuhai, China. Construction started in October 2007 and has been completed on schedule, with the boat due to leave on a ship bound for the UK on 8 May. The boat was constructed in a facility located about 60 miles northwest of Hong Kong, The mainly Australian-led team at McConaghy’s has been working alongside US designers Reichel-Pugh and structural engineers Applied Structural Analysis Ltd (ASTA) from the UK, as well as a 90-strong Chinese build team. A total of 40,000 man hours have gone into the completion of the boat. Green Team. l to r: Jamie Boag (CEO), Eamon Conneely, Enda O’Coineen, Ian Walker (skipper), Richard Duggan (CFO). 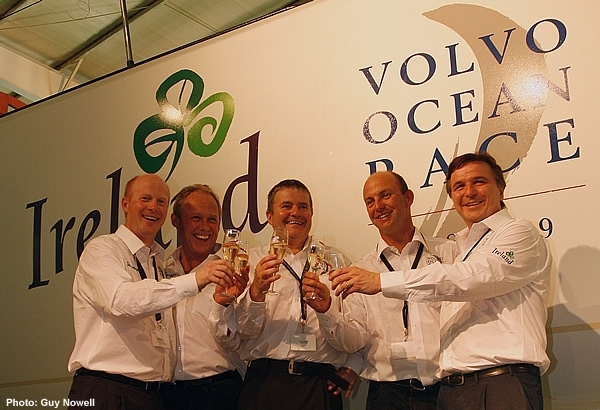 Celebrating the completion of the new Green Team VO70 at McConaghy Boats, Zhuhai, China. After welcoming speeches from Green Team principals, guests were treated to a spectacular kung fu martial arts demonstration followed by a traditional Lion Dance performed by four lions, before Green Team skipper Ian Walker asked everyone to raise a glass of champagne by way of a more Western ‘blessing’. With the build now complete the team will prepare the boat to be shipped to Europe, with an anticipated arrival time of early June. 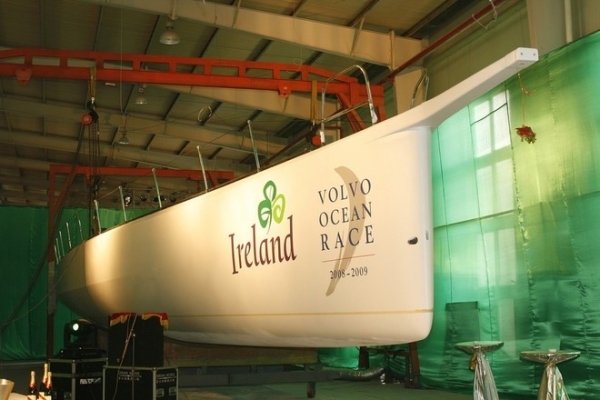 Once in the UK the boat will be assembled and tested fore two weeks before heading to team’s home port of Galway in Ireland, which will be the team’s base before leaving for Alicante in September. Galway is one of the stopover ports during the 37,000 nm Volvo Ocean Race which starts in Alicante in October. Galway’s position in the west of Ireland allows for excellent training facilities for the team, with the testing conditions of the North Atlantic on the doorstep. I think it needs a better paint job…and I think it needs more pictures, more information about crew, more PR, more excitement, more for the Irish fans!!! !